No time for yeasting dough? Don’t worry! These Quick Dinner Rolls have no yeast. They have 3 secret ingredients that make them cotton soft. Ready in 30 minutes! Watch the tutorial below and learn how to make No Yeast Bread Rolls easily! They are soft rolls that don’t call for yeast, so easier and quicker to make. This recipe is one of the easiest homemade bread recipes on our blog and I think that’s why it has become one of the most tried recipes as well. Easy, simple, quick and quite satisfying, these quick dinner rolls are worth trying. My favorite rolls recipe until this one was Fluffy Pogaca Recipe, which has yeast and mineral water inside. I still love that but this one is way quicker. We all love short cuts, right? This recipe is a great example for doing things in a shorter way because it doesn’t call for waiting until it rises thanks to baking powder, yogurt and olive oil. This will become the ultimate bread roll recipe in your home. Who can resist newly baked soft and fluffy dinner rolls? I’m sure spreading a little butter on one of them when it is still hot can easily take you to heaven. There is no yeast in the dough, so you don’t need to wait it to rise. This really reduces the time and you end up with super quick rolls that are soft enough. They are ready in about 30 minutes, so you can make these simple no yeast dinner rolls right before the dinner and make the whole family feel in heaven. I got the recipe from a colleague at a potluck party and adapted it to my taste. She stuffed the rolls with cheese, which is something traditional in Turkey and they were amazing! I felt like I was eating the best rolls in my life just at first bite. I had had no idea on how to make bread without yeast before. When I asked the recipe with a big curiosity, my friend said that it is really easy. She said that the recipe even has a special name. 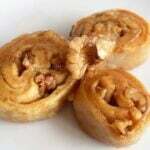 It is called 3-2-1 rolls because the ingredients include 3 packages baking powder, 2 cups yogurt and 1 cup olive oil. She didn’t give the amount of flour, she said I just need to add it gradually until I have a non-sticky dough. Don’t worry, I measured all the ingredients for you. One of the secrets of these quick dinner rolls is that there is no water in the dough. Yogurt and olive oil are the only wet ingredients in the dough and they make the rolls super soft. The other thing that makes these rolls super magical is baking powder as the substitute for yeast. Use 5 teaspoons baking powder in the dough. I hadn’t used that much baking powder in a dough before, but believe me it’s not too much for these rolls. I sometimes use a combination of all purpose flour and whole wheat flour in the dough to have a nice color and to make the rolls more filling. However, it’s optional; just skip it if you like white looking breads. They are even softer when you make them using only regular all purpose flour. The ones you see in the first picture on the top are made with all purpose flour. I used only white flour when updating the recipe with a video and they turned out even softer than the one with a combination of white flour and whole wheat flour. Try not to use much flour. Although the no yeast rolls turn out fine with the measurements in the recipe, add the flour gradually until everything holds together. Even the brand of flour you use might cause different results, so you might need to experiment to find the right amount. It’s okay if the dough is a bit sticky. Use a little oil (olive oil in my recipe but you can use whatever oil you like) to wet your hands and make small balls from the dough. I use olive oil in this recipe because I like it, but you can use whatever oil you like if you don’t like olive oil. You can even use melted butter. As some readers suggest in the comments below, it might be a good idea to add herbs and garlic in the dough. These homemade rolls without yeast are great on the day they are baked. I love them cold too on the next days but if you are after soft rolls, I suggest you to reheat them in the oven or microwave so that they get as soft as they are on the first day. Soft and fluffy quick dinner rolls without yeast. Secret ingredients are yogurt, olive oil and baking powder. Preheat oven to 370F (190C). Line a baking sheet with parchment paper and put aside. Mix baking powder, yogurt, olive oil, salt and sugar in a large bowl well. Whisk all purpose flour and whole wheat flour and gradually add the flour into the wet mixture and mix with your hand or with a stand mixer until you have a non-sticky dough. Shape the dough into balls and place them on the parchment paper. Beat the yolk well and coat the top of dough balls with it using a brush. This post was originally published in 2014 and has been updated with a video, a new photo and some additional information. I had no bread in the house and was looking for a quick and easy recipe. (Something sandwich-like) Had no yogurt either so used milk with a squeeze of lemon. Turned out amazing! Stuffed it with some edam cheese and smoked turkey. I’m glad to hear that you loved these quick rolls. We love them with cheese too! Bet smoked turkey would be great too. Thanks for your feedback! I made these tonight but did not sift the flour, as it wasn’t in the recipe. I needed to cook for about 30 minutes for them to brown. They turned out very heavy and dense. I only used all purpose flour and not as much as called for. Any idea what I did wrong? Hi Kristi! Sorry to hear that you didn’t get the desired result. Was the dough too dry when making balls? It’s fine if it’s a bit sticky. Also, we should mix it with hands just until everything is combined, not more than this. If we play with the dough too much, it gets dense when baked. Hope these help. I just made these. I halved the recipe and 2.5 cups of flour made the dough dry. I baked them anyway. They taste okay but they look nothing like the picture or video. They taste okay and my children ate them with butter but next time I’m going to just buy the yeast. Can you freeze this? Maybe once rolled but before baked? Hi Jackie! Yes, I think you can freeze the rolls before baking. You need to thaw and then bake them. Can I use sour cream instead of yogurt? Unfortunately, never tried it with sour cream. I just guess it might work. Would love to try this one.. can I brush it off with butter instead of egg?! Hi Riza! Yes, you can. Can you use mayo instead of yogurt? I’ve never tried it, so no idea. I’d love to hear the result if you try it. Just made it. Used whole wheat flour, thick buttermilk, coconut oil and halved the recipe because we are only two people and I wanted to make them for dinner only. Came out great! Thank you for the recipe. One tip, add the flour gradually, as much needed for the dough to form, I didn’t need all the flour called for, but that might also be because I used whole wheat flour. Will make again! Hi Urmi! I’m so happy to hear that you loved the recipe. Your version sounds great! Thank you for sharing your experience here! Hi, great recipe, will try tonight. If I don’t have whole wheat flour, can I use more of all purpose flour. Hi Nat! Yes you can use all purpose flour instead. How interesting, rolls without yeast, I definitely have to bake them! Never have made dinner rolls without yeast before, I have to give it a try this weekend, thanks for sharing! These are very easy and very tasty. I will definitely make them again! Hi Teresa! I’m so happy to hear that you love these. Great especially when you don’t have time for yeasted dough. I tried the recipe tonight and really thought they turned out great. I made a few slight alterations to the recipe. I only used 3-4 cups of all purpose flour and used grapeseed oil instead of olive oil. Other than that I kept the recipe the same. The key is to not use as much flour as suggested (for lighter rolls). I mixed everything in my Kitchen Aid mixer following the directions. I had enough dough for about 30+ rolls. I’ll definitely be using this recipe again. Thank you! Hi Meredith, glad to hear that you loved the recipe. Using less flour for lighter rolls is a great tip! I should have stated it in the post. Thanks for reminding! Can I use rye flour instead? Never used it, sorry. It might work though. Hi Taylor, never tried it in a loaf, but I guess it works fine.